Now seems like a good time to announce that we have a new baby on the way! 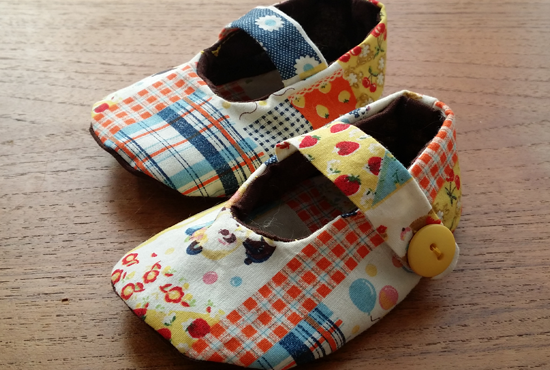 With that in mind I have turned my hand to making some cute baby shoes this week. 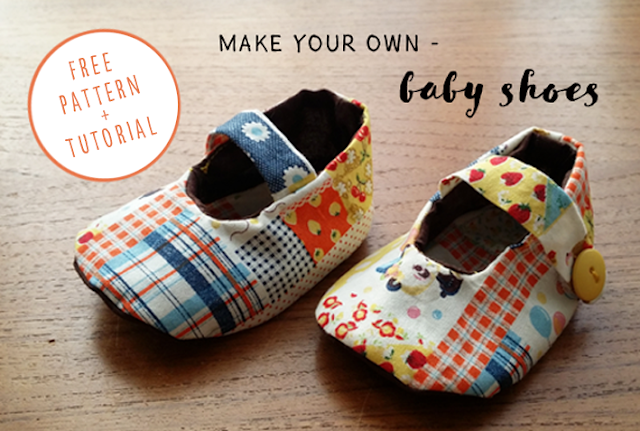 This is also the first of many posts to include a free printable pattern to download, to accompany the tutorial. Hope you like it! I must admit, being the first time I have ever tried this I found some parts pretty fiddly. I have not been discouraged though, and have so much lovely fabric sat about that I shall be trying these again and perfecting the technique, and tweaking the pattern. You don't need much material for these shoes as they are so teeny tiny, I used about a quarter of a fat quarter of each fabric. A very small amount of velcro strip! 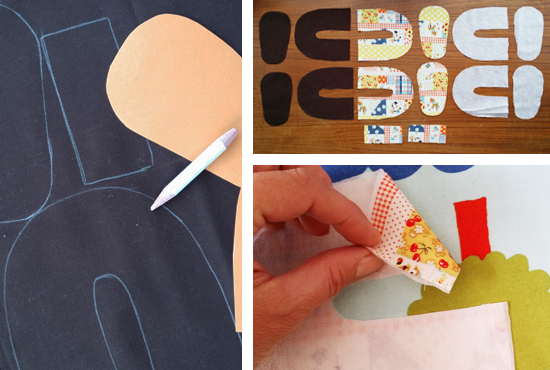 1) Cut out the paper pattern, and transfer this to your fabrics for cutting. You need to end up with 2 of each shoe piece in each fabric, plus 2 strap rectangles in the outer fabric. See pic. 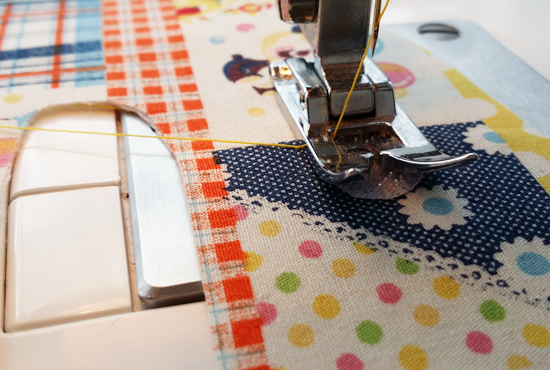 *Make sure the gummy spots on the interfacing are face down to your fabric and not the iron! 3) Make the straps by folding the rectangle pieces lengthways, right side together, and stitch up the open sides with a 5mm seam allowance. I decided to make mine curved, you can freestyle this if you fancy it, or stick to straight edges if that's easier. These then need to be turned right side out, which I found really tricky due to their small size! I used a pencil end and my nails, and a good handful of patience! 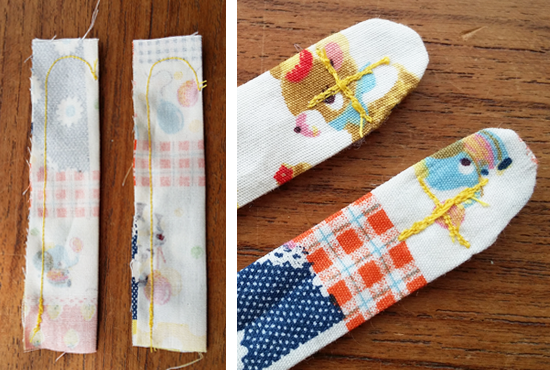 4) Cut small circles of velcro and stitch these to the straps, using 2 crossed lines to secure. Secure the opposite velcro pieces to each U-shape as shown on the pattern, on the right side of the fabric as shown above. You then need to position the straps, velcro side up, in line with the velcro on the U-shape. See pic. Once happy with the position, stitch these in place. 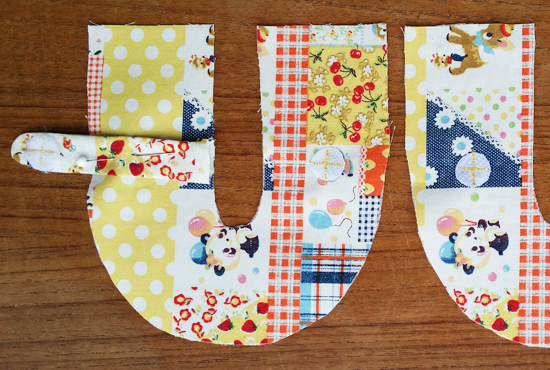 5) Next fold the U-shape pieces in half, right sides together, and stitch with a 5mm seam along the straight edges. 6) You now need to attach the inner U-shape piece to what will be the inside sole. 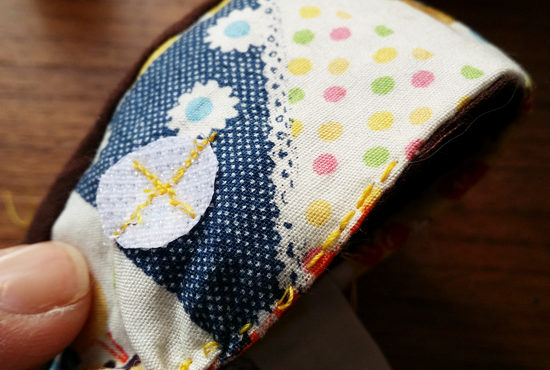 I found this to be the trickiest part, so (after a few attempts and a lot of unpicking) I found it best to hand stitch them together before going to the sewing machine. 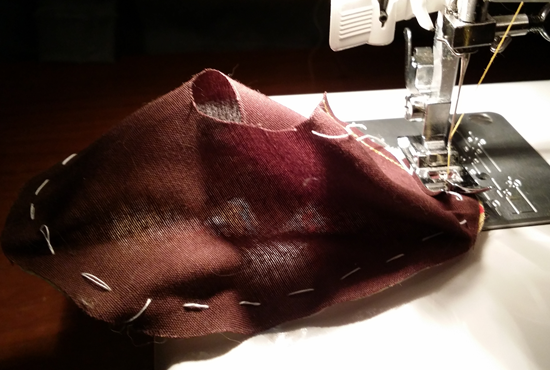 You really have to bend the fabric as you are joining them, to get a nice curve shape. I plan to practice this! 7) Once you have both outer shoe piece and inner shoe piece prepared, place the inner inside the outer and stitch around the top where the foot will go in, leaving a 30mm gap for turning right way out. Trim all around with pinking shears so you get a clean edge when you turn out. Once turned the right way out, retuck the inner shoe piece back into the shoe to give the final shape. 8) Press the little shoe with an iron, to ensure a good clean shape, and then hand stitch the opening that you left from the outside. And that's it! 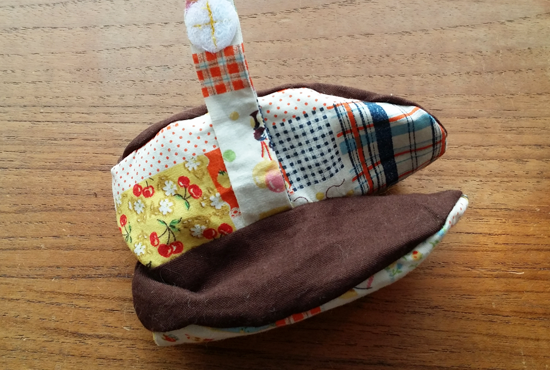 This is a very easy pattern, but not such an easy make! I think with a bit of practice, and a larger shoe size, this could be perfected. I need more making time in my week! The finished shoe size is 0-6 months, perfect to keep those tiny toes warm and looking cute! 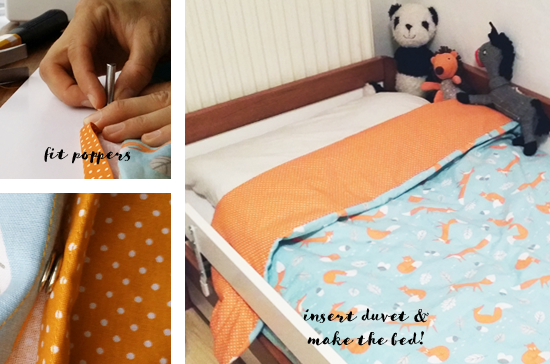 This week I was at the sewing machine again trying my hand at making a reversible duvet cover for my daughter. 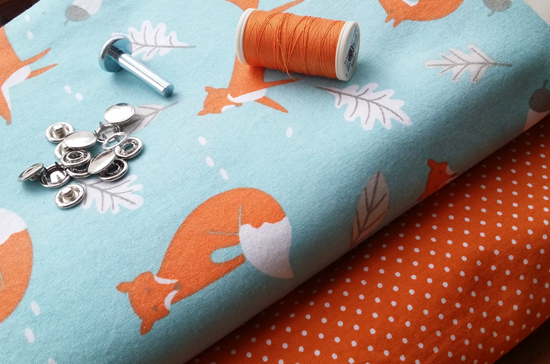 I found this lovely fox print cotton fabric on ebay some time ago, and have been searching for the perfect pattern to compliment it for the reverse side. 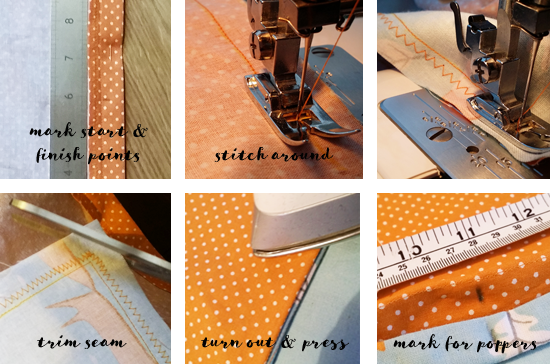 Last week I found it - a perfect matching orange fabric with tiny pin dots. I knew she would love it! This was a really fulfilling project to do, and I get to see the happy customer go to sleep all snuggled up in it every night. I think that's worth the 6 hours of cutting, measuring, pinning, pressing and stitching! 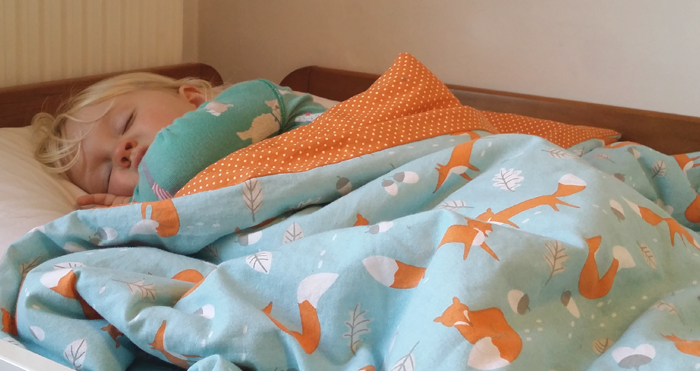 Granted you can go and buy a kids duvet cover cheap as chips, but putting the time and effort into making a bespoke handmade cover for your little one is really rewarding, and she loved watching the process through to the final result, and I got big 'thank you' cuddles! 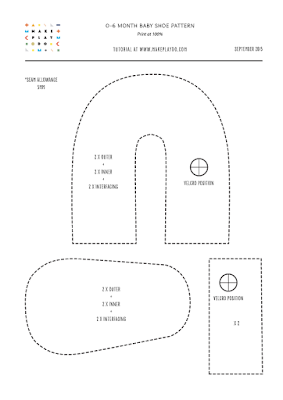 1) Measure & cut your fabric. My duvet measures 120cm x 150cm, so I added 1.5cm seam allowance to the top and sides, and 5cm to the bottom. You can play with these measurements how you like, but don't forget to add more at the bottom than the top and the sides. 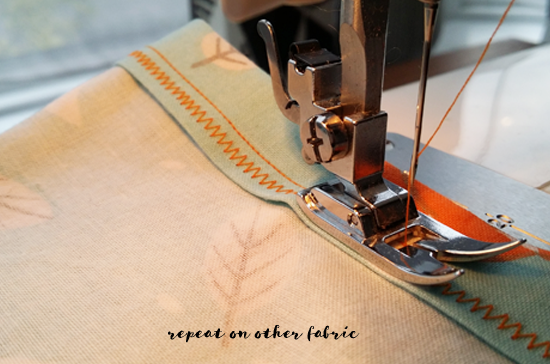 Fold over again at 2cm and repeat the process with a straight stitch, so your left with a neat pressed and stitched bottom to the fabric. This will become the opening area, where the poppers will attach. 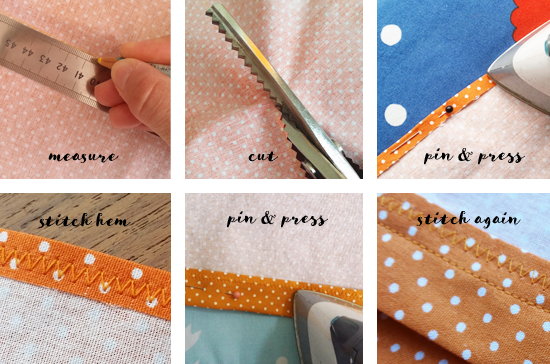 Placing your 2 fabrics RIGHT sides facing, pin all around carefully. Straight stitch all around, leaving an opening across the bottom that starts and finished from approx. 15cm in. As the cover will be washed regularly I then restitched the same with a zigzag, to prevent frayed edges and secure it. Trim away the corners carefully, so that there's no puckering when you turn the right way round. Careful not to cut too close to the stitch. Once turned the right way out you should have a nice neat cover with smooth corners, and an opening at the bottom. 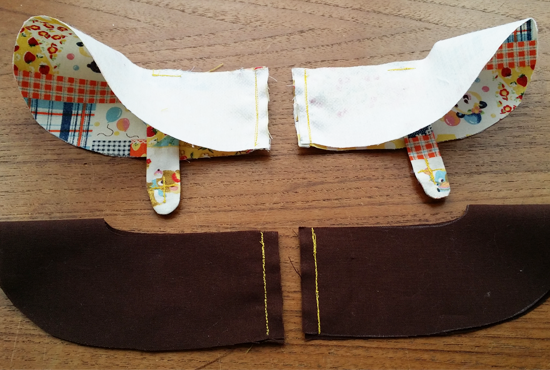 Press the opening inner seams flat to give a clean line and prepare for the fastenings. I measured the first popper dead centre of the opening, and then a further 2 placed equidistantly. I marked these points with a pencil. I used these great little snap fasteners, with this little tool that cost £1 on ebay. You put the male and female parts through the fabric as required, and hammer into place. Bosh! That's it - sounds really easy, and it was - but it took a lot longer than I imagined. Worth it to do a neat job though and this duvet will surely get some use. Enjoy having a go - let me know how you get on! Here's a snapshot of some recent wedding stationery I designed for the lovely Amy & Mike. I put together an invitation pack for them, bound in a copper and black wrap around. Opening up you find the main invitation, additional information (complete with illustrated map), and RSVP cards, tied together with some copper thread. At the bride-to-be's request one of the RSVP cards is a cassette tape, for guests to name their tune for the evening playlist. What a great retro touch! This was a really fun project to work on, drawing pine cones, acorns and wheatgrass and finding just the right typefaces for the job. I also really liked drawing a map and adding some personal touches specific to the happy couple. Including a metallic element was a nice challenge, and Amy was very excited to receive her proof in the post - saying it was like opening a Wonka bar and finding the golden wrapper! I even got some lovely round cornering into this project, gotta love a round corner!